With clouds hanging low in the sky this morning and the peaceful sounds of the dove cooing, and echoing over awakening mountains…I find myself in a melancholy kind of mood. I’m not sure, but I think several events that occurred in the past two weeks have helped me to arrive at this level of emotions this morning. Yes, it’s been an eventful couple of weeks. Not that it’s been a particularly sad, unhappy, or over zealous events, but nevertheless weeks of events that others might find to be insignificant or may not give any thought to all. I don’t know, maybe I think too deeply, or maybe I react differently than some. It wouldn’t be the first time that I’ve been accused of, “reading too much” into things. Maybe, it’s the poet within me that ignites my senses. Maybe…I am an over-thinker, maybe I over react, or maybe…I am becoming more receptive of what the Lord is trying to impress upon me or instill within me. Nevertheless, I think I’ll enjoy the mix of emotions that fill my cup this morning. To say the last couple of weeks were busy is an understatement. My daily planner has been overflowing with appointments. Urgent appointments to work on taxes as the deadline swiftly approaches. Scheduled appointments with advisees worrying about their upcoming schedules and anticipated graduation dates, appointments with colleagues to discuss students, curriculum, and more, appointments with students who desire to enter the Education Program, and the most important appointments of all…the ultimate appointed daily time of prayer with our Lord, Jesus Christ. Over time, I have found that keeping this daily appointment helps make all of the other appointments more meaningful, purposeful, and cohesive. And then there’s those divine appointments that often seem to spring up from know where! Or do they? Was it a by chance meeting? Did I just happen to be in the right place at the right time? Was I supposed to be there? What do you think? Were those divine appointments predestined, or were they by chance? Over the past few years I have come to believe and have arrived at the decision that time is precious. Time is one thing that we cannot get back. With time, there are no do-overs! Thus, we must make the most of every precious moment that we are blessed with. I have arrived at another conclusion through various moments and gentle reminders within my spirit that it’s not about me, or us. It’s about helping others, being a positive beacon in the dark times that others might be enduring, it’s about Him, and about living a happy and appreciative life so there are no regrets. This has led me to the belief that all meetings/appointments whether they are planned or unexpected, in a professional setting, or if it’s in the checkout line at the grocery store can be a positive experience, thus, divine appointments. So, how do I define divine appointments? Divine appointments do not have a criteria per say. Divine appointments can be the student whom I speak with that is struggling to pass a very important test. A divine appointment can be a friend who needs to be encouraged. A divine appointment can be the lady behind you in the checkout lane who is struggling with finances, or the loss of a loved one. A divine appointment can be simply the stranger that you meet in the frozen food aisle who is in search of a friendly face or a smile. A divine appointment can be that someone you meet who is unsure of the world around them. A divine appointment can be an elderly parent who needs to be reassured that their life was purposeful and that they did a great job raising their children. A divine appointment can be a colleague who needs a simple pat on the back or a hug. A divine appointment can be the young lady who has checked out thousands of dollars of groceries to bitter impatient customers and would like to have a kind word. A divine appointment can even be the person who is trying to pull into traffic, but others have left unnoticed. Divine appointments have been defined with a variety of definitions by many people over the years. However, my definition of divine appointments is simply an opportune meeting with another, whether it is scheduled or by chance, that allows you spread cheer, love, joy, kindness, a positive attitude, while also showing the love of God. As a professor, I am continually encouraging my students to reflect on their week. So, as I enjoy the taste of my favorite coffee this morning, the sounds of the mountains coming alive, the purposeful crowing of our roosters, the soft snoring of my canine friend, Freckles, who is napping by my feet, and a little “me” time…I find myself following my own advice by reflecting over the past two weeks, while also thinking about the divine appointments that I have had, and whispering a prayer for those whom I have had the pleasure of encountering through those divine appointments, and also counting my blessings. I find myself questioning my self as well. Have I truly enjoyed the time that I have been blessed with and what more can I do for others? With reflections of days gone by and visions of the days ahead of me…I feel excited, inspired, and look forward to the moments and days and opportunities that lay ahead of me, as well as the divine appointments that await me. 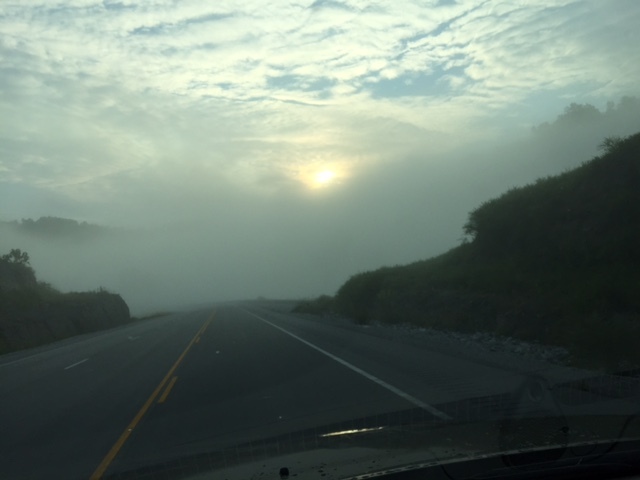 From the mountains of Kentucky…be blessed and enjoy the divine appointments that you encounter. Feel free to leave comments as I enjoy hearing from each of you. Ten Achievable Goals that helped Improve My Year and My Life! Do you find yourself making New Year’s resolutions year after year that you simply do not keep? If so, don’t feel bad, because you are not alone. Making and breaking resolutions is a common practice among a large majority of people whom I surveyed. Many of the people I surveyed had similar responses when asked about the resolutions or goals they had previously made and also previously neglected. Some of the neglected goals included; lose twenty or more pounds, exercise more, read twenty or more books per year, organize my entire house, save more money, shop less, spend less time on my phone, watch less television, pray more, go to church every Sunday, eat healthier, floss my teeth everyday, and the list goes on and on. I must admit, I too, have made and neglected several of the above resolutions in the past. It’s hard to believe that it’s already the time of year to set new goals. But first, before setting new goals, we must reflect on previous goals. As the year comes to a close I find myself browsing my memories of the year 2016. I also find myself reviewing my goals that I wrote down in December of 2015. Had I achieved them? Had I tried to achieve them? Did I veer off the path? As I reviewed each goal that I had carefully chosen and written down I felt a sense of satisfaction. I had worked hard to attain my goals. Did I ever fall, or fail? Yes, I had worked hard, and yes, I had veered off the path several times. However, I had gotten back up, and dusted myself off and resumed the path that I had mapped out for myself. Had I achieved all of my goals? I achieved some of them, but made progress with all of them. Some of my goals are still a work in progress, but nevertheless I am progressing. What were my goals? How did I and how do I maintain my desire to achieve them? What was my plan? I am anxious to share my ideas with you so that you too can set realistic and achievable goals to help improve your year and your life. Nearly six years ago while trying to decide what goals to set for myself I realized that the goals that I had previously set, and previously neglected, we’re not realistic goals. My goals were too large! I should have set more manageable goals. Was this possible? My mind immediately rewound and replayed my voice. I could hear myself encouraging my first grade students. I could visualize myself explaining to six-year olds how to set realistic goals. For example, I had students whose goal was to read “big chapter” books. I encouraged them to set mini-goals to read small books first. When they achieved this goal, set another goal to read lengthier books, then advance to small chapter books, and finally begin reading their desired “big chapter” books. So, the decision was made. I would try to follow my own advice that I gave my first, fifth, and sixth grade students when setting their goals. I would begin by setting smaller more achievable goals. It worked! I had made it through an entire year and had made progress with each goal that I had set. I felt really good about myself and was more encouraged, positive, and better able to deal with stress on those days when I felt the urge to cheat on my diet, spend a little extra on myself, etc. I was also able to resume my plan and move forward on the path that would lead to achievement. The goals that I set actually helped change my year, and have improved my life every year thereafter. I now find myself repeating this story to many of the students that I advise each semester in an effort to encourage them and to also help them learn to set realistic and achievable goals that are meaningful and will change their life as well. What are these goals? I’m excited to share them with you so that you too can make positive changes in your life. First and foremost, start the day with prayer and meditation as well as a little “me” time. I enjoy walking my dog early in the mornings. This gives me the opportunity to gain exercise, pray, meditate, plan, reflect, visualize, dream, and also appreciate nature, while allowing my canine friend to gain her exercise. Me time can be walking on the treadmill, enjoying a quiet cup of coffee, yoga, a long hot bath, or relaxing on the porch. Wherever your happy place may be…take the time to pamper yourself and focus on you every day, even if it’s just fifteen minutes. I have found that me time promotes peace, tranquility, and a positive attitude, all of which will help you reach your desired goals. Stop dieting! What? That’s right, stop dieting! Simply make better food choices. I achieved this goal by eating less processed foods, less restaurant food, meal prepping, and also planning my meals. Drink less soda and more water. Replace at least one unhealthy item with a healthy item. For example, replace white sugar with stevia or honey. Bake foods instead of frying them. Replace white bread with whole grain bread. Decrease salt and increase black pepper. Replace cream based dressings with oil based dressings. Eat Greek yogurt instead of regular yogurt. Eat crunchy veggies and fruit instead of chips. This list could go on for pages. Do you have to make all of the above changes? The answer is no. Simply, select one or a couple that you feel would make your diet more healthy. Once you’ve become accustomed to this change you might find that you will have a greater desire to replace more unhealthy foods with healthy ones. Take the step to reducing your intake of unhealthy foods. Remember, your journey begins with a single step and a single choice. A gift I received as a result of a random act of kindness. I’ll treasure it always. Read every day, but don’t focus on reading a large number of books in a year. Simply set a goal to read at least twenty minutes per day. This will keep your mind fresh, be a healthy change from television or your electronic device(s), while also helping you to learn something new everyday. Remember, we’re never too old to learn. Reading improves the memory, thought process, and also is a wonderful form of entertainment. In today’s technological society reading is more convenient than ever before which limits your excuses to not read. You can achieve your desired reading goal by reading on your smart phone, tablet, kindle, in a magazine, newspaper, blog post, or my favorite…a good old-fashioned book! Reading for twenty minutes each day will also help you spend that quality time with yourself that we all need and deserve. Make time for family and friends. I have come to realize that time does not slow down, for anyone or anything. It truly feels that time is passing more swiftly than ever before. Do you ever think about how eager you were to grow up when you were a child? I’ve thought about this often over the years and have advised my young students as well as my children and grandchildren to slow down and enjoy being a child. We are a child for a short time and an adult the remainder of our lives. Time is something that we cannot get back once it is gone. Make the most of it and enjoy time with family and friends. Plan to have dinner together, road trips, family night, visit each other, go out to lunch, have coffee together, go shopping, or simply sit on the front porch (without our smart phones) and enjoy conversation with them. This can include your immediate family, extended family, and or friends. Don’t take time for granted…make time for family and friends. So, you want to save a little money? We’ve all made this resolution or set this goal, and all of us have also ended up breaking this resolution or not meeting our goal. I decided several years ago to cut corners on unnecessary spending by watching for bargains, clipping coupons, and also use digital coupons. I also decided to take my lunch to work to avoid buying lunch or spending money in the cafeteria for food that ended up being tossing in the garbage, or consume unhealthy food that I did not need. The result was a smaller grocery bill each week, a few more dollars in my purse at the end of the week, and feeling of satisfaction. Whether it was one dollar or ten dollars each week the savings were added to my makeshift bank, which started as a simple zip-lock bag, and quickly grew to a small storage container. This year my savings were used for various things. I used part of it to help with our remodeling project, to pay my granddaughter who likes to earn a little extra money by dusting, walking my dog, or vacuuming the inside of my jeep. I had a nice little Christmas savings as well. Did I veer off of the path, did I stumble, lose sight of my goal, or go on a spending spree? Well, I didn’t go on random spending sprees, but I did enjoy a few shopping trips…but I am always on the lookout for bargains. Did I eat out for lunch? Of course I did occasionally as it was a great way of spending quality time with family, colleagues, and or friends. We all need to indulge occasionally, but it’s important to not fall into a pattern of indulging on a regular basis. It was a great feeling to have my extra savings available when I needed it without having to dip into budgeted money, or our savings account. I look forward to exceeding last years’ savings this year through the same simple steps. I challenge you…take a cup of coffee with you instead of buying that specialty coffee everyday. Make that specialty coffee a special event, take a friend out for coffee occasionally and spend quality time with them while enjoying your favorite cappuccino. I enjoy an occasional cup of coffee from our local coffee shop. Exercise more, yeah this is one that most of us make year after year. Year after year we start with a zest and a made up mind, but also year after year we lose that fire and determination and fall into a rut once again. Nearly six years ago, I began working toward this goal in various ways that has helped improve my health and also helped me to achieve my goal, as well as maintain my weight after losing seventy pounds. What did I do? I simply set realistic small goals for myself. These goals included walking my dog daily, even when it was snowing or raining. Parking farther away from the store, even when it’s snowing or raining. Using the elliptical daily, even if it’s just fifteen minutes per day. I have also worn a fitbit for the last three years and tracked my daily steps. Boy, was this an eye opener! I have worked hard to ensure that I am actually getting up and moving every hour. There are hours during the day that I cannot get up and move, such as during my commute to and from work. However, I find this great “me” time, time to listen to an audio book, time to do breathing exercises, and also time to pray, meditate and reflect on the day or plan for the next day. Exercising more can include going to the gym, going to zumba class, or running in the park. But, let’s face it…with the demands of our jobs and the fast paced world we live in, these are not always an option. Instead, take time each day to achieve your goal in small manageable as well as realistic goals. Get up and move everyday! I track my steps using a fitbit. Get organized! This is a goal that I too have several failed attempts. It is now a work in progress and I can see the light at the end of the tunnel. How did I do it? One area at a time is how I started this goal and have maintained my progress. Also, with each mini-goal, I use the three-step process. I make sure that I have a container for donations or sell items, items you wish to keep, and a container for unwanted items to toss. I began my organized journey with the linen closet. I was amazed how much soap, deodorant, air fresheners and many more items I found while cleaning this small space. I bought enough one dollar plastic bins to line the shelves and labeled each so everyone in the family knew where to put items away. Labeling has helped me maintain a clutter free and organized linen closet. Once a month for a year I have worked to de-clutter and organize an area of our home, and once a month or more for a year I have tossed, donated, or sold the excess items and organized the things that I chose to keep. I love having less clutter and more organization as well as space. My home is still a work in progress, but there is a significant less amount to organize and de-clutter than there was last year! Cha-ching…another realistic goal achieved! I love being able to clip fresh herbs from my herb box. Make a blessing jar. This was an idea given to me by my Sunday school teacher. Last year was the first year that I had set this small, but significant goal. I simply took a container that I already had to use for my jar. I used a small crock that a previous student bought me. It was the perfect container to add and collect my daily blessings. Several people decorated jars, boxes and other various containers. This is how it works; Simply, find a container or make one, at the end of each day write down something positive that has happened during the day. Trust me, even on those days when everything seems to be going wrong…you can find something positive to be thankful for. The object is to find positive things in your life and to take focus off of the negative things, which happens to all of us. The plan is to open your blessing jar on New Year’s Eve or New Year’s Day and revisit and read each blessing that you wrote down. It’s a great way to reflect, remember, count your blessings, while also promoting a positive frame of mind. I challenge you to try it…go ahead and begin today counting your blessings. In review, these are the realistic goals that has helped improve years for me including 2015, had a major impact on my health, happiness, and my family as well as my life; make a blessing jar, grow a plant, get organized, save a little extra money, make time for family and friends, read every day, stop dieting and most of all make time for yourself! These are only suggestions, and not scientifically proven, but goals that helped me have a better quality of life. What are you waiting for? Today is already the second day of the new year! Have you set your goals? Are your goals realistic? Revisit the goals that you’ve already set to ensure they are realistic and achievable goals. If you’ve not set your goals yet…take that first step of your journey to achieve your resolutions, or your goals! Remember, your journey to a better life begins with a single step. I hope you’ve enjoyed reading about my New Year’s goals and resolutions. Please feel free to leave your feedback. I’m interested in your goals and how you achieved them. God bless and have a wonderful 2017! There is one thing that is certain…life is uncertain. Every day is filled with surprises, some are welcomed while others are not. But through the years I have learned to take life one day at a time. I have learned not to dwell on the past as we no longer live there. I have learned to not depend on the future as we never know our day of departure from this life. However, I have found that reflecting, not dwelling on the past, is a healthy practice to achieve peace and contentment. I have also found that setting goals, but not solely relying on those goals, but working one day at a time to achieve them has brought me much happiness, and I wasn’t devastated when I had to veer off the path occasionally. Enjoying the morning reflecting on the past…briefly visiting plans for the future. Saturday mornings are usually a time of rest, relaxation, and reflection for me. These are mornings that I enjoy a cup of coffee, the sounds of our small farm waking up. Roosters crowing their good mornings from their roost, the puppies barking from the puppy pen, and the rain softly tapping on the windows. This particular morning I am enjoying the beginning of Christmas break. Our tree is up and decorated, shopping is finished, packages are wrapped, and the turkey and ham await our dinner in the freezer. Christmas break isn’t just loved and appreciated by the students at UC, but also loved and appreciated by the professors and all of the staff and administration as well. Christmas break allow us time to rest, relax, reflect, plan, prepare, and above all to enjoy time with our families. With the days of a busy semester behind me and plans for the upcoming semester hovering above me…I find myself this morning counting my blessings. Yes, it’s been a busy semester. Yes, it came with challenges and yes, I learned much from life’s experiences, as well as from colleagues and students. No, life hasn’t been perfect. It’s been anything but perfect. However, as I think about others who are facing so much heartache from the loss of their loved ones, sickness’ that are ravaging their bodies, traumatic stress from horrible addictions of their loved ones, loss, failure, and much more…I, although not living in a perfect world, am blessed. Our immediate family hasn’t suffered the loss of an immediate loved one during the year 2016, we have homes to protect us and house our families, we have food to feed and nourish our bodies, we have clothes and shoes to protect us from the elements, jobs that provide for our families, churches where we worship freely, and the saving grace of God that fills our hearts. Our family also gained a new addition this year. We greeted and welcomed our fifth grandchild into our family. Was life perfect? No, it was anything but perfect. There were stressful days, hurtful days, heartache, loss, sleepless nights, hard work, sadness, anger, and many other realities real emotions that visit everyone. However, I have learned over the years to take each day one day at a time, live each to its fullest as these are days that we will never be able to live again, pray hard, learn from the experience(s), move forward, get up when we get knocked down, be thankful for what we have, and expect better days ahead. So, as I enjoy the warmth of the fire in the fireplace I find myself reflecting on the past and briefly revisiting plans for the future…I find myself being thankful for past days, weeks, months, and years, and the experiences that each provided, whether they were happy, sad, good or bad…each of them has helped to mold me into who I am today. I hope you’ve enjoyed browsing my memories and sharing one of my special days. Please, feel free to leave your comments and visit again. 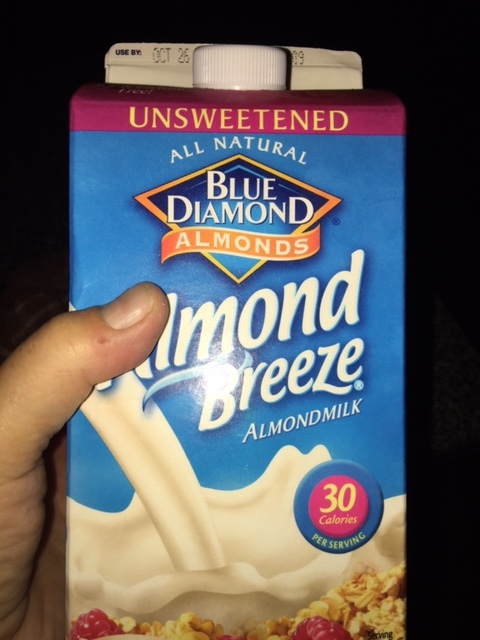 If you enjoy healthy delicious sweet snacks, feel free to check out Random Acts of Kindness & Clean Almond Joy Bites… for a delicious holiday, or any day treat. Merry Christmas and God bless from our house to yours. Have you ever felt compelled to display a random act of kindness? Did you act upon it or did you override the feeling and let the opportunity pass by? Maybe you felt like stepping aside and allowing the person behind you in the checkout line to check out ahead of you. Maybe it was the gentleman sitting on the curb holding a homeless sign that stirred the desire within you to buy him a meal from McDonalds, or maybe you thought about leaving a kind note in your co-workers mailbox. Did you follow your heart and act on your feelings? Whatever the kind thought or act of kindness that you feel compelled or inspired to do…I urge you to act on the impulse. You see, we truly do not know what others may be going through. Many people display a happy face in public even when their hearts are aching with sadness, or they’re in a turmoil trying to make an important decision, or just feeling a little down for no particular reason at all. A random act of kindness that may seem insignificant to others, may be a prayer answered for another. Discouragement visits everyone at one time or another. Recently this sad emotion invaded my peace of mind and tried to camp out long term and linger within my thoughts. I had encountered one of those weeks where I felt tired from daily appointments, overwhelmed with obligations, pressured to meet deadlines, and terribly worried about a loved one’s heath. But, with a smile on my face and faith in my heart I pressed on and prayed for peace as I did not like feeling this way. . Peace came in a way that I didn’t expect. I was reminded through a series of small random acts of kindness over a period of days from various people that helped the feeling of discouragement dissipate . I found a small notecard in my mailbox from a student with kind words that filled my heart, two days later I found a candle on my desk from a colleague with a thank you note, and finally one of my students told me the other day that if she could be like anyone in the world, she would like to be like me. What a heartfelt compliment and unforgettable moment. I’m thankful for each of these random acts of kindness as each was timely, and each helped restore my faith in mankind and each brought a smile to my heart and face. The daily appointments are nearly over and I still feel energized, obligations no longer overwhelm me, and a plan of management is in place to help meet the deadlines that fill my calendar. I am still concerned with my loved one’s health issue, but through the random acts of kindness that I received I am better able to think positive, have increased and renewed faith, and expect better days ahead. With peace and contentment also comes inspiration. So, with the holidays ahead and plenty of opportunities to overindulge in sweet treats I decided to post a new clean candy sweet treat that’s easy to make and one that I enjoy indulging in without the guilt! I hope you enjoy them as well. I plan to deliver some special treats to my coworkers this week…just a simple random act of kindness that I feel compelled to do. I hope you enjoy my clean version of Clean Almond Joys Bites. In a glass bowl combine unsweetened shredded coconut, honey, vanilla, and half of the coconut oil. Place in the microwave for just enough time to melt the coconut oil. Mix and allow to completely cool. You may either roll the mixture or spoon the mixture onto cookie sheet lined with parchment paper. Place in the refrigerator and allow to chill for at least thirty minutes. I prefer to spoon the coconut mixture onto the parchment paper. Just before removing the candy from the refrigerator place the remaining coconut oil and dark unsweetened chocolate in a bowl and melt in the microwave. While the chocolate is melting place one almond on top of each piece of the coconut candy. Spoon the hot melted chocolate mixture over the chilled coconut balls and refrigerate again until completely chilled and the chocolate is set. Finally, enjoy your sweet treat without the guilt! Delicious bites of pleasure without the guilt! Don’t forget if you feel compelled to do something nice for someone…don’t talk yourself out of this random act of kindness act on your feelings. I hope that I have inspired you with my story as I am still inspired by others’ small acts of kindness. These thoughtful acts of kindness helped brighten my day, lighten my load, inspire me, and helped me to smile from my heart. I hope that you enjoy the clean almond joy bites. Please feel free to leave feedback as I love to hear from my readers. So, it’s been a little while, actually too long since I’ve posted. I’ve been under the weather with carpal tunnel and am finally ready to re-enter the blogging world! I’ve missed my computer, my readers, and reading other blogs. But with the diagnosis of carpel tunnel also came a plan of recovery, which included clean eating! But, first things first…let me catch you up on what’s been going on my world. The holidays found me as they did most of you cheating a little here and a little there. Am I right? As for me, I enjoyed a indulging in a few Christmas cookies, a couple of pieces of Christmas candy, and of course those savory Christmas dinners with all of our wonderful relatives. With those delicious moments of indulging also came a few extra pounds, a slightly elevated cholesterol, and the suffering that comes with carpel tunnel, which included joint pain, inflammation, and some sleepless nights. But, with all of the this…the life of a college professor doesn’t stop. Classes must go on! So what’s a girl to do? Limit her time on the computer, and get back to my routine and love of clean eating. an eight ounce glass of room temperature lemon water first thing in the morning every morning to help kick-start the digestive system. breakfast of either fresh egg whites with wilted baby spinach (I also included onions, red peppers, and mushrooms) or a plain cup of plain Greek yogurt with a fresh fruit and a drizzle of raw honey. fruit choices included apples, tangerines, strawberries, red grapes, blueberries, or fresh peaches. Lunch consisted of lots dark green lettuce, fresh veggies, with either tuna in water, grilled chicken, or grilled turkey. Supper consisted of fresh vegetables steamed or cooked with grilled salmon or halibut. the meats could be rotated between lunch and breakfast. Snacks included fresh fruit (no bananas) or a handful of almonds. For the first two weeks I didn’t incorporate any grains, or pasta into my diet and also drank one cup of unsweetened green tea after each meal to help increase metabolism, I also included eight full 8 ounce glasses of water daily as well. I reduced my coffee intake to two cups per day. And I returned to working out on my elliptical on a daily basis. I started slow and increased a couple of minutes each day. The results of my all of the hard work and dedication paid off. I dropped the five unwanted pounds that I had gained through the holidays as well as two more stubborn pounds that had hung around far too long! With the clean diet also came less inflammation and more restful nights. My doctor prescribed an arm brace to wear at night and while on the computer, which made a huge difference. I’m also a believer in prayer as well, so between many prayers, a clean and safe detox, returning to a dedicated clean diet, adding more exercise into my daily routine, and a simple arm brace…I’m back at my computer with no pain, down seven pounds, and feel like a brand new person. I’ll return to the doctor in a few weeks to have blood work to check my cholesterol level. I’m expecting great results there too! Remember, we’re only human. We all have desires, cravings, family dinners, and we all enjoy sweet treats occasionally! We all fall of the wagon occasionally, but the important thing is to regain focus before things get out of control. I’m excited about regaining my vision, inspiration, and love of clean eating. I’m also excited about being back in my comfortable routine after a couple of weeks of indulging in unplanned meals. I’m thrilled about losing a few extra pounds, and thankful that I physically feel well enough to spend the time that I need to with God, my family, students, my computer, my blog, and simply feeling well enough surfing the web with no pain. I give God the praise and glory for it all. I’m also super excited about upcoming posts. I will be sharing new clean and delicious recipes with you! Be sure to come back and check out my blog weekly. I’m planning to post recipes on Mondays. Driving to work this morning was such an awesome experience! It was the same stretch of road that I have traveled for years! But, this morning God’s beauty and grace seemed so very evident, as was the beginning days of fall. I always dread saying good-bye to summer, but eager to welcome fall. I think I enjoy events, colors, activities, food, and the wardrobe that comes with fall more than other seasons. Okay, secret’s out…I love wearing sweaters and turtle necks! I also love baking in the fall! Even though it’s not technically fall I baked one of my favorite breads Saturday Morning. 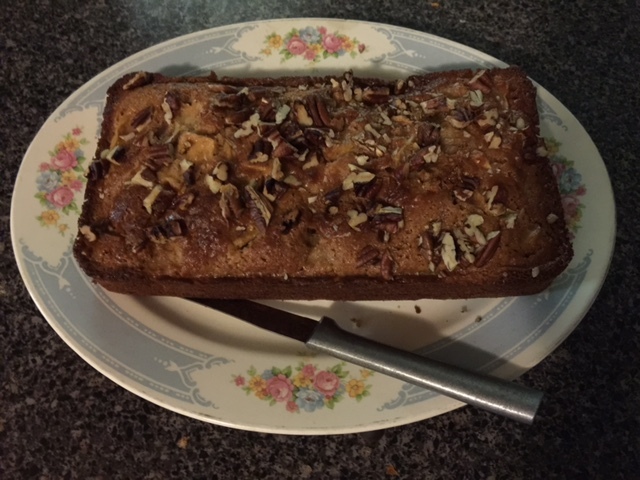 I baked it for our ladies meeting at church, and it quickly became a favorite among many of the ladies as well. Most of them were surprised when I told them it was clean. Several didn’t know what I was referring to when I said clean, so it started a nice conversation about clean eating while we enjoyed a variety of dishes. 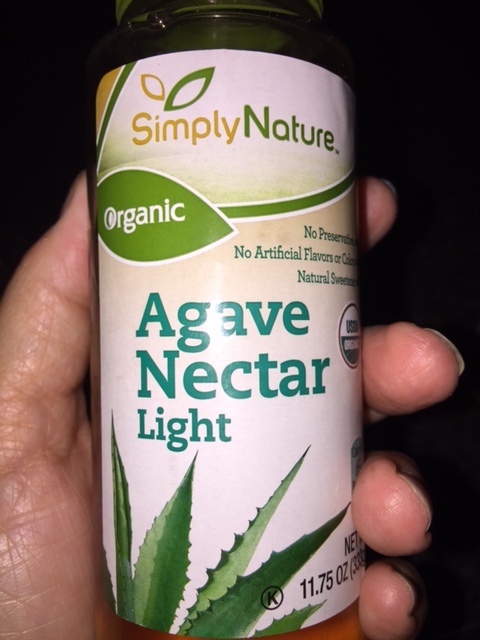 Agave nectar is a great way to sweeten any drink or dish! 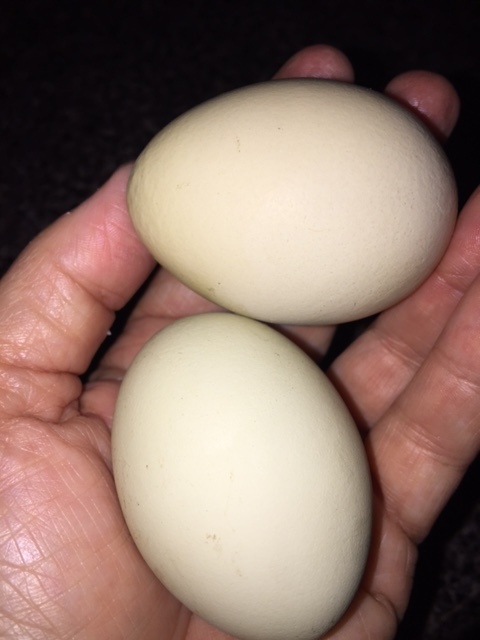 I love having fresh farm eggs that I know are truly organic. 1.) Whip eggs with a wire whisk and through a strainer into mixing bowl. 2.) Add and mix wet ingredients one at a time. 3.) 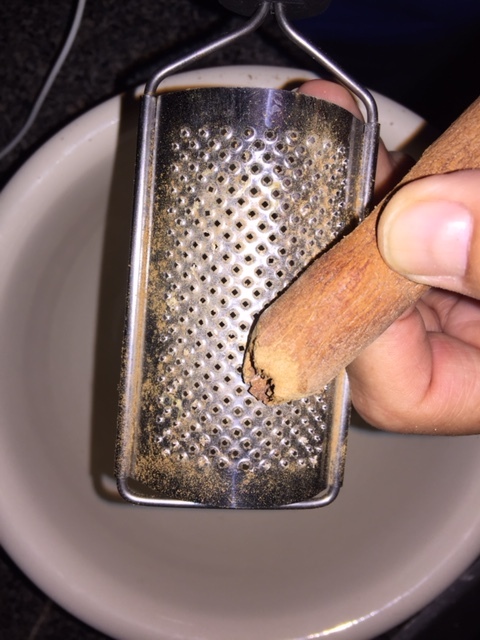 Sift flour through a sifter, or a wire strainer to promote a smooth texture. 4.) Incorporate dry ingredients, spices, and lastly add the diced apples. I like to add the apples last to prevent bruising while mixing the ingredients. I like larger chunks of apples in my bread. 5.) Pre-heat oven to 350 degrees F. 7.) Pour batter into the sprayed loaf pan, sprinkle rough chopped walnuts, and bake for 30 – 40 minutes. (You can increase the amount of nuts and incorporate them in the batter as well.) Oven temperatures may vary, so baking time may vary. 8.) You will know your bread is done when the sides pull away from the pan, and the bread is brown. You may also use a toothpick to test. Insert a toothpick in the center of the loaf, if it comes out clean your bread is ready! This is a recipe that my family enjoys for breakfast, lunch, warm, cold, for dessert, or just as a snack! It will make you feel like you’re cheating, but you’re not! I truly love eating a slice of this delicious bread warm with frozen vanilla yogurt, and a cup of hot coffee. I’m excited to hear how you enjoy eating this deliciously clean treat! 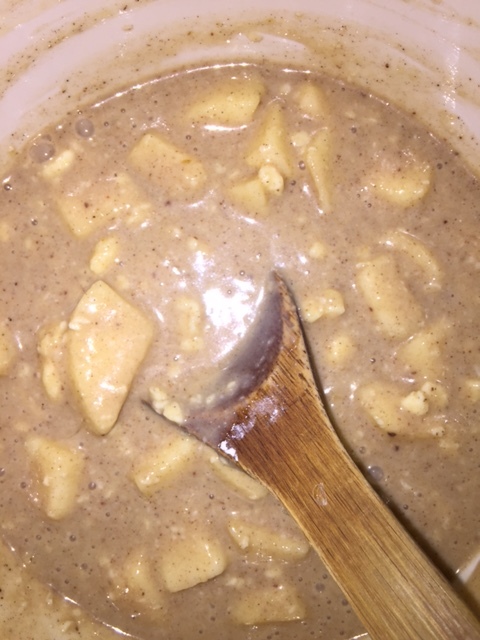 If you enjoyed this recipe, be sure to check out my post for Almond Fruit Dip! I’m excited to bring you more fall favorites including; My Pumpkin Passion Smoothie, Pumpkin Apple Bread, zucchini Bread, all of which are clean and delicious! Thank you for taking time to read about my journey through clean eating! Feel free to leave comments. I love to hear from you!